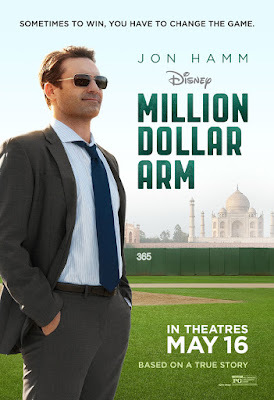 MILLION DOLLAR ARM is a straight forward no-nonsense sports under-dog story imbued with all the earnest good intentions and feel-good loveliness that a Disney movie entails. It's based on the true story of baseball pitchers Rinku Singh and Dinesh Patel who were discovered by sports agent J.B. Bernstein after winning a reality show competition and went on to become the first Indians to play major-league baseball. The conventional character development arc lands on Jon Hamm as the sleazy hard-up lothario and agent JB. He initiates the completion as a means to revive his career and has no interest in his putative stars other than the commissions and new clients they can win him. Naturally, India is a transformative experience - particularly a visit to the boys rural village. It's a cliche that I find as insulting now as I did when I watched THE DARJEELING LIMITED. But not content with one movie cliche, the film introduces another, when JB falls for his kind-hearted no-nonsense tenant - a doctor played by the ever-authentic Lake Bell. She brings the most out of a two-dimensional character and softens both JB's heart and ours. The obvious things happen. There are high pressure try-outs that are fumbled and second chances at redemption. The mean nasty businessman has a heart of gold and all things can be cured by the love of a good woman and a visit to a third world country. All of which is highly disappointing given the quality of the cast - not least the Indian actor Pitobash - and the director Craig Gillespie (LARS AND THE REAL GIRL) and writer Tom McCarthy (UP). If Disney had been willing to make the film a little grittier, and JB a little less likeable, they could have done something really memorable. 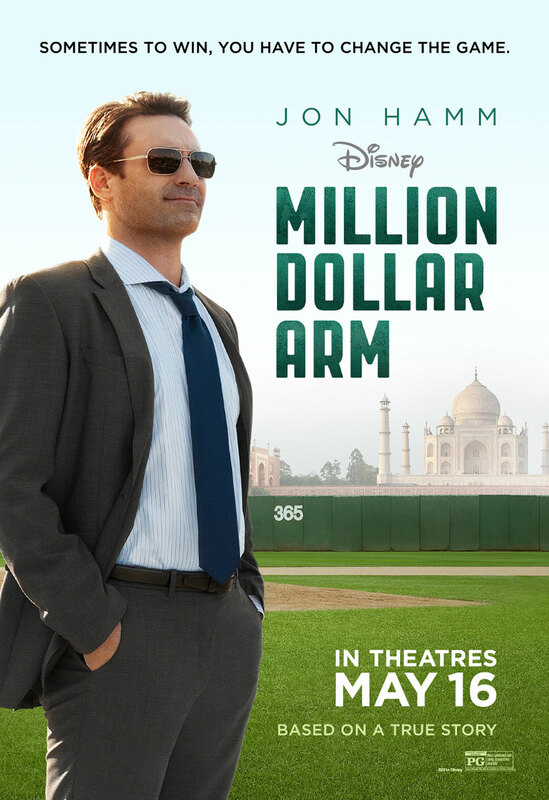 MILLION DOLLAR ARM has a running time of 124 minutes and is rated PG. The movie was released earlier this year in India, Canada, the USA, Cambodia, Pakistan, Argentina, Greece, Chile, Turkey, Mexico and Peru. It opens this weekend in the UK and Ireland. It opens in September in Italy, Panama, Colombia, Germany, Denmark, South Africa and Brazil. It opens in October in Japan, Spain and Norway, in Hungary on December 1st and in Sweden on March 11th 2015.